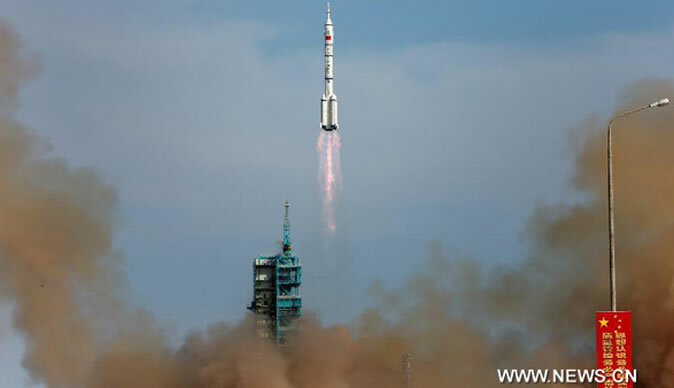 JIUQUAN - China successfully launched its fifth manned spacecraft late Tuesday afternoon, sending three astronauts on the country's longest space trip. With 10 astronauts and six spacecraft launched into space in a decade, China is speeding up on the path of exploration and building a home for Chinese in the galaxy. At a see-off ceremony held hours before the launch, Chinese President Xi Jinping extended good wishes to the three astronauts. "The mission's crew members carry a space dream of the Chinese nation, and represent the lofty aspirations of the Chinese people to explore space," said Xi. The President later watched the launch at the Jiuquan Satellite Launch Center in northwest China, and shook hands with staff at the center after the successful launch. Unlike the space trip of Yang Liwei, China's first astronaut who boarded the Shenzhou-5 spacecraft in 2003, of less than a day, the three astronauts will stay for half a month. In its journey, Shenzhou-10 will dock with the orbiting space lab Tiangong-1 twice, once through automatic operation and the other manual, and a lecture will for the first time be given on board the assembled orbiter to a group of teenage students on the ground. Compared with the previous nine Shenzhou spacecraft, the Shenzhou-10 is no longer experimental but considered an applicable shuttle system for transporting astronauts and supplies to orbiting modules. "It is like developing a new type of car. You have to try it on roads of different conditions. Now trials are over and the car can be put into formal operation," said Zhou Jianping, chief engineer of China's manned space program. On the other hand, the upgraded Long March-2F carrier rocket is technically the same as the one used with the Shenzhou-9 manned spacecraft. "No alteration means that China's rocket technology is becoming mature," said Jing Muchun, chief designer of the carrier rocket. This mission aims to further test technologies designed for docking and supporting astronauts' stay in space, as well as to use new technologies related to the construction of a space station, said Wu Ping, China's manned space program spokeswoman, at a press conference on Monday. The Tiangong-1 space lab has been in orbit for about 620 days, and about three months are left before the designated end of its service. The module is considered the first step toward China operating a permanent space station around 2020 and making it the world's third country to do so. The nation is likely to launch a space station before 2016. There are risks that the conditions of some components on Tiangong-1 might not be at their best since the module is near the end of its service and has gone through four docking tests, Wu said. For Nie Haisheng, commander of the three-member crew and a second-time space traveler, this mission will be longer, with more experiments to be conducted, than his previous outing in 2006. "It will be a new challenge with greater risks," Nie told the media on Monday. However, he is looking forward to entering the space lab module. "My colleagues and I will work in a home for Chinese in space," he said. For this mission, the manned space program also considered approaching the public. In a lecture through a live video feed system, female astronaut Wang Yaping will introduce motion in a microgravity environment, surface tension of liquid, and help students understand weight, mass and Newton's Laws. Wang will also interact with students and teachers on Earth and the lecture will be broadcast live. Ordinary Chinese, especially science enthusiasts, are excited about the new mission. "It is a festival for space fans," said Zhao Yang, a researcher with the China Science and Technology Museum, who just watched the Hollywood sci-fi blockbuster Star Trek Into Darkness on Monday. He was very much interested in the lecture to be given in space, saying, "There might be an interesting introduction about the weightless condition." For renowned science fiction novelist Liu Xinci, Tuesday's events reinforced his belief that he will live to see space travel become accessible for all common people. He has a very vivid vision of future life. "In the next century, human beings will set foot on all planets in the solar system. People will inhabit the moon and Mars. A lot of people will work in space as space journeys will be as easy as flights." The three-member crew were all veteran Air Force pilots before being selected as astronauts. Nie is the first general visiting space while his teammate Wang Yaping is China's first space traveler born in the 1980s, a generation growing up in era of reform and opening up. All of them are members of the Communist Party of China. Yang Liwei, the country's first astronaut, once told Xinhua that Chinese astronauts might not pray like their foreign counterparts do before they set off on a space mission; however, Communism, as their shared faith, supports them. "If the country has its own space station, Chinese astronauts, who are Party members, might set up a Party branch up there," Yang said. Of the crew, 48-year-old Nie is commander of this mission, and responsible for the manual docking operation with the Tiangong-1 target orbiter. Zhang Xiaoguang, 47, will assist the commander to accomplish the spacecraft's manual docking with Tiangong-1. Another job that Zhang will be doing in space is to film Wang's lecture lecture, which will be broadcast to middle and elementary school students in China. Wang, 33, is the second Chinese female astronaut after Liu Yang in the Shenzhou-9 mission, which blasted off in June last year. Wang will be responsible for monitoring the conditions of the spacecraft, space experiments, operation of equipment and taking care of fellow crew members.